Every element of your landing page is essential in driving conversions for your product. The headline creates a first impression. The hero shot makes your product more tangible and demonstrates its value. The landing page copy mentions features and benefits. The sign-up form collects your visitors’ email addresses. Customer testimonials add social proof. While all landing page elements have their own roles to play, nothing is more powerful than your headline. A good headline is what compels people to pay attention. If they do, other parts of your page get to perform their important functions. Do you think that coming up with a good headline is difficult? If so, you’re not alone. Choosing an effective headline is like choosing a name for a brand new business. It only takes a single word to mess up your headline. So… How do you come up with the right landing page headline? To give you inspiration and jumpstart the headline creation process, headline tools are your best friends. I have come across several headline generators, but my list of 10 below stands out. 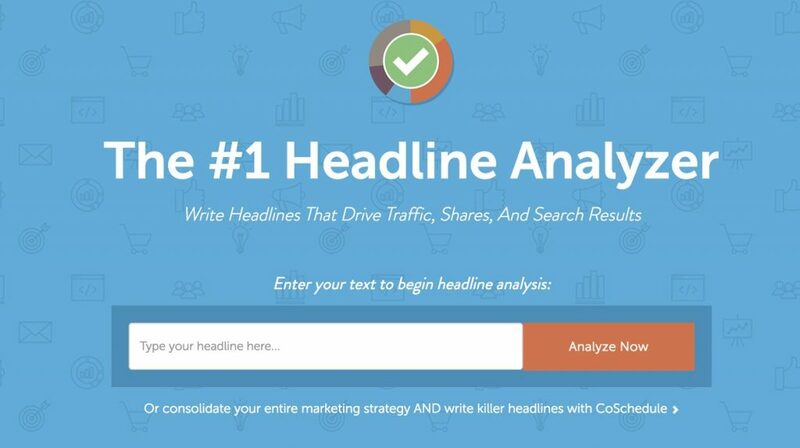 Headline Analyzer by CoSchedule is a tool that will tell you if your headlines have the potential to rank and convert. All you need to do is enter your headline and click “Analyze Now.” If this is your first time to use CoSchedule, you need to provide details of yourself before CoSchedule gives you the complete analysis of your headline. CoSchedule will show you an overall rating score for your headline. It then suggests improvements in terms of length, keywords, power words, grammar, readability, and more. You’ll get an email and search engine preview of your headline’s appearance. SEOPressor has updated their title generator tool this year to give you more options for better headlines. The headlines produced by this tool are not only catchy, they’re also specific to the topic. After you type in your desired keyword, choose whether your keyword is a generic term, brand/product, event, industry, person’s name, or skill. You’ll get title suggestions by 4. Just click the refresh button for additional titles of the same keyword. Press-release style titles work best if you’re offering case studies as one of your landing page lead magnets. When it comes to the sources of inspiration for these types of headlines, BuzzFeed is a good one. Ravi Parikh created BuzzFeed Title Generator to automate the process of coming up with titles similar to those in BuzzFeed. To get started, simply press the button “Click Here to Generate” for title ideas. Of course, you’ll need to tweak a title suggestion to make it applicable to your landing page. Do your landing page headlines touch your audience’s feelings? Emotional headlines drive people to follow your call-to-action. 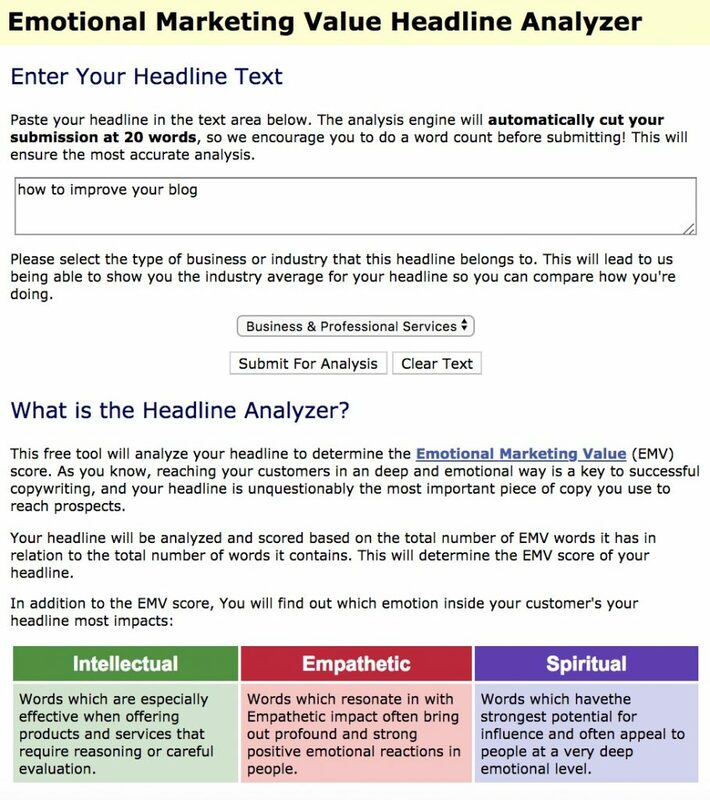 To figure out whether your headlines contain emotional triggers, use Advanced Marketing Institute’s Emotional Marketing Value Headline Analyzer. 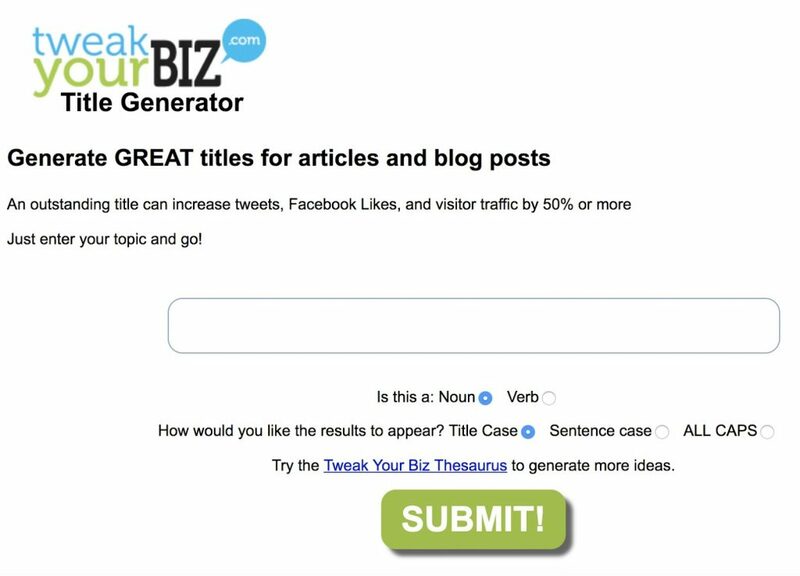 This tool scores the effectiveness of your headlines based on the Emotional Marketing Value words that they contain. You’ll know if your headline has an Intellectual, Empathetic, or Spiritual appeal. Portent’s Content Idea Generator gives headlines that are catchy and funny. Not all title suggestions are appropriate for your topic, but there are those that stand out. This tool claims that its headlines can increase your visitor traffic to at least 50%. Surely, you won’t run out of interesting and relevant headline ideas. Not only can you enter a topic, you can also indicate whether your topic is a noun or verb. You’ll get a different set of results based on your choice. What’s great about Tweak Your Biz is that it categorizes titles – Lists, Best, How To, Questions, Secrets, and more. FatJoe gives you random title ideas. There’s no option for you to categorize your topic. Because of its lack of filtering options, sometimes you’ll get inappropriate titles. In case you can’t find what you’re looking for, just click the button “GENERATE 100 MORE TITLES.” To be able to get these additional 100 titles, you need to enter your email first. Inbound Now is a quick and simple headline tool in that it immediately suggests unlimited titles. There’s no need for you to enter your topic or keyword. 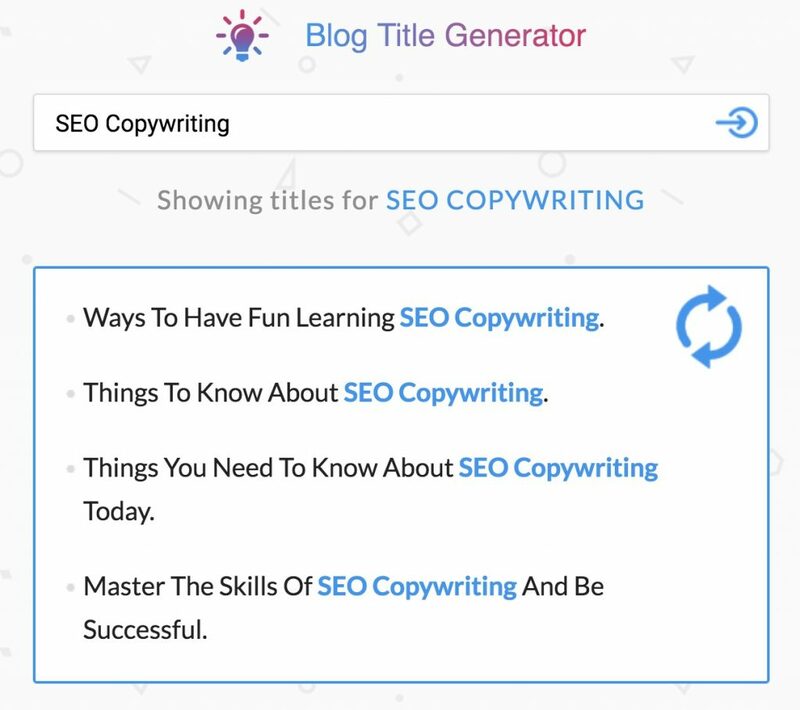 You’ll be guided by the words in the brackets to create SEO-friendly titles. Notice that some titles require you to enter a keyword, number, target audience, common problem, and industry. 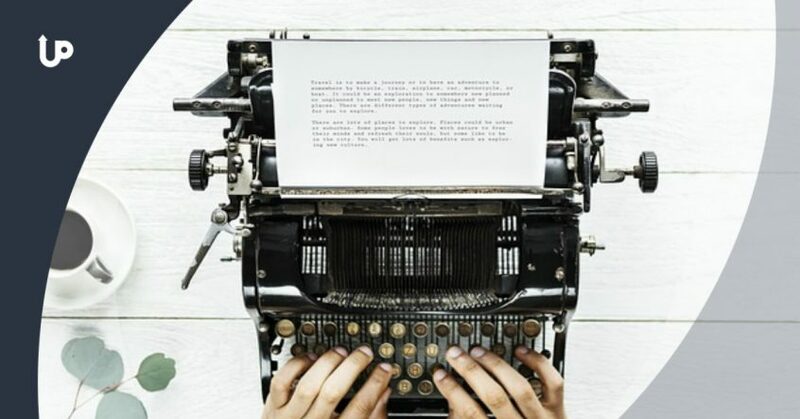 Writer’s block shouldn’t stop you from creating effective landing page headlines. As a fill-in-the-blanks tool, you can come up with titles in an instant. Save a list of your favorite titles by clicking the heart icon. BlogAbout will then email you your list of titles. Another feature of this tool that you’ll like is that it allows you to doodle on a blank notebook to spark creativity. It’ll take you only one click to generate 700 headlines. If you aren’t even sure what your landing page is about in the first place, Title Generator offers you no shortage of ideas. While the above-mentioned tools inspire you to generate great headlines that attract potential email subscribers, there are some ways to verify their effectiveness. In this section, I share with you 3 writing techniques that ensure better headlines. Remember that people buy something not because of its features, but because of the end result they may gain. That end result is called the benefit – the promise that your product holds. 2 – Go straight to the point. Simple and straightforward headlines immediately deliver whatever message you have for your audience. By reading your landing page headline just once, people know what it is that you offer. Not only does a straightforward headline take less time to come up with, it also allows for faster conversions. Straightforward headlines converted at a rate of 88% compared to creative headlines which had a conversion rate of only 12%. 3 – Perform A/B testing. A/B testing or split testing takes the guesswork out of knowing which landing page headlines work best. In fact, split testing is something you should never miss. In one of my split testing tips that I recommend, I advise anyone not to split test immediately. It’s counterproductive to split test right after you create headlines. What would give you good results is when you launch your landing page first and see if a headline performs. From there, you can start split testing to improve a headline that is already converting. 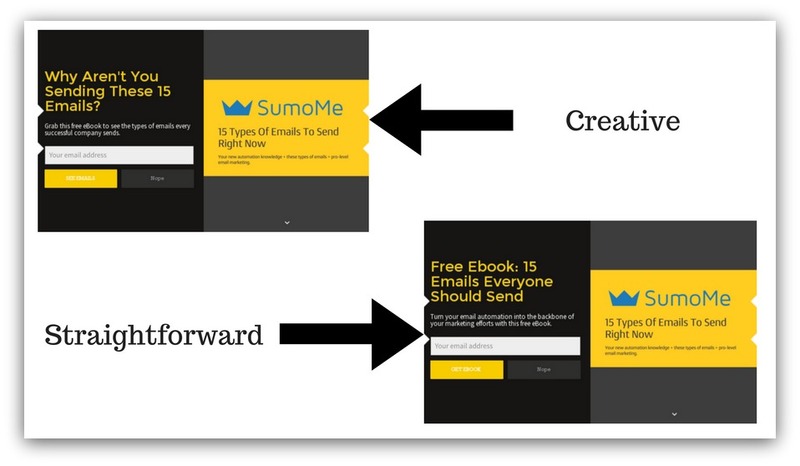 At UpViral, we want people who build landing pages with our platform get actual conversions. If you use UpViral, you can create 2 or more of the same landing page but with different headlines. Once you get inside the UpViral app, enter your campaign. 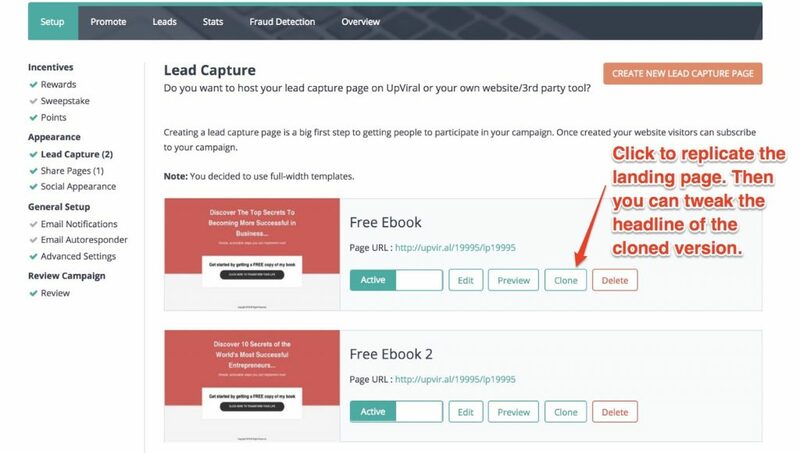 Under “Setup,” click “Lead Capture” to create multiple versions of your landing page. Since you’re only going to focus on different variations of your headlines, simply click the button “Clone” of your original landing page. Next, click “Edit” of the cloned version to tweak the headline. The words in your headline are of prime importance in meeting your conversion goals. While you shouldn’t neglect other parts of your landing page copy, understand that the headline is what ignites the interest of your audience. Contrary to people’s common beliefs, creating a landing page headline doesn’t have to be difficult and time-consuming. Tools get the ball rolling. Then back them up with the copywriting tips you’ve learned so far, including the ones we discussed – emphasizing the benefit, getting straight to the point, and A/B testing.